BACKGROUND: Payers often consider cost-effectiveness studies for new drugs when making decisions on coverage, formulary position, and budgets; however, cost-effectiveness studies are often calculated using estimated pricing before a drug’s launch. If the drug’s price changes on or after launch, or if rebate programs are initiated, cost-effectiveness studies need to be updated to prevent payers from making decisions using inaccurate value assumptions, which can lead to unexpected financial impacts and potentially delay patient access to drugs. OBJECTIVE: To evaluate how lower at-launch drug pricing versus initial estimated pricing affects cost-­effectiveness ratios and potentially influences treatment decisions, using the case study of brodalumab, a biologic drug indicated for the treatment of moderate-to-severe plaque psoriasis. METHODS: We compared the estimated cost-effectiveness of brodalumab, which was published in a December 2016 Institute for Clinical and Economic Review (ICER) report based on estimated pricing, with the drug’s cost-effectiveness based on its actual pricing after its approval. 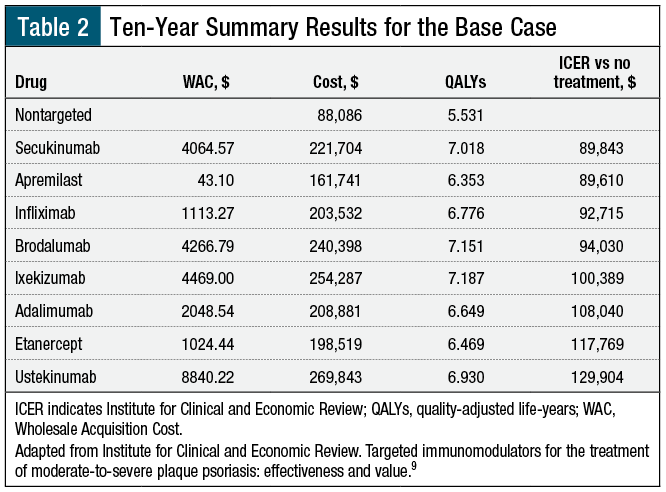 DISCUSSION: The 2016 ICER report on the cost-effectiveness of targeted immunomodulators indicated for the treatment of moderate-to-severe plaque psoriasis, brodalumab’s price was estimated to be $4267 by averaging the cost of its likely competitors. Brodalumab’s effectiveness as a treatment for moderate-to-severe plaque psoriasis is high in clinical trials, but its estimated cost placed it as the fourth most cost-effective targeted immunomodulatory drug in the ICER report. On its approval in February 2017, brodalumab’s newly estimated base price was $3900, based on its prelaunch price. Calculations using this base price placed brodalumab as the most cost-effective option among targeted immunomodulators in this setting. At the time this current article was written, brodalumab’s cost was $3500, making it even more cost-effective. CONCLUSION: Because payers, providers, and patients are all concerned with achieving better outcomes for the often painful and disfiguring disease of plaque psoriasis, while controlling costs, updating cost-effectiveness data when new pricing information becomes available may reveal significant cost differences to help stakeholders make better decisions about their population’s healthcare outcomes and costs. Cost-effectiveness studies of pharmaceutical agents that will soon be released to the market are an important tool that payers and health plans can use when making decisions on coverage, formulary positioning, and budgets. 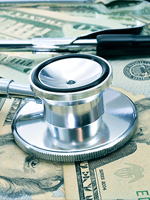 For payers, providers, and patients alike, price is a critical piece of the decision, with all parties seeking the best outcomes for the lowest costs; however, cost-effectiveness studies are often based on a drug’s prelaunch estimated cost. When the drug’s price changes at launch or postlaunch, some pharmacy benefit managers (PBMs) and health plans update their own budget impact and cost-effectiveness models. Other PBMs and health plans that rely on outside sources may continue to use cost-effectiveness studies that have not been updated, which means that many payers are implementing decisions based on estimates that are no longer accurate. Therefore, it is important to reevaluate a drug’s cost-effectiveness when updated pricing data become available. This article uses the example of brodalumab, a biologic drug indicated for the treatment of plaque psoriasis, to show how updated pricing can affect cost-effectiveness considerations. Despite the clinical improvements that biologic therapies (and apremilast) provide, the widespread use of biologics may be limited by their high cost relative to older, small-molecule drugs. Managed care plans control utilization of this category, in part, based on cost-effectiveness evidence—the incremental cost differences between drugs divided by their incremental clinical improvement. In the case of brodalumab, an estimated price was used in a ­nationally recognized cost-effectiveness analysis before launch.9 Price transparency before a drug launch by the manufacturer would have avoided the need for estimating the Wholesale Acquisition Cost (WAC). In that analysis,9 the estimated price was higher than the actual market price at launch, which necessitated a reanalysis. When comparing patients with psoriasis who are the most costly to health plans with the least costly patients, patients in the costliest tier have significantly more comorbidities, including diabetes, cardiovascular disease, psoriatic arthritis, depression, and anxiety, and they incur more unique prescriptions.20 The costliest patients with psoriasis also have significantly higher inpatient and emergency utilization than patients in less costly drug tiers, but the use of biologic medications and biologic drug costs do not vary much across the 4 cost tiers.20 Thus, there is not much differentiation between cost tiers and biologic drug use among these patients, which would support using the most cost-effective agent in a class. Our case study specifically demonstrates the impact of price on the treatment hierarchy for moderate-to-severe plaque psoriasis. An adjustment in WAC from an estimated average of other agents at $4267 versus an actual price of $3900 moved brodalumab from being the fourth most cost-effective targeted therapy to the most cost-effective targeted therapy. In fact, at the time this article was written, the WAC price for brodalumab was $3500,26 which would even further distinguish this agent from its comparators as being the most cost-effective agent for moderate-to-severe psoriasis. However, the proprietary nature of the ICER model does not allow for a recalculation of outputs; it can be assumed that the cost-effectiveness ratio would be improved with a lower price. An important component of calculated net price was the inclusion of estimated rebates by drug class, and this could further distinguish drug pricing among medicines in clinical practice. Therefore, the reassessment of cost-effectiveness reports based on updated pricing is important to inform health plans; however, plans still need to consider how their net price compares with the model’s inputs. As decision makers incorporate value assessment into their formulary and benefit designs, the impact of clinical and economic inputs on the outputs of cost-effectiveness models are important to consider.21 The choice of inputs for these medicines, including accurate and updated pricing information, is a dynamic process. As other new pharmaceutical entrants come to market, cost-effectiveness will need to be reevaluated. This study has limitations that are common to many modeling studies. Cost-effectiveness modeling studies are only as robust as their data inputs. With regard to cost, it is important to remember that WAC is only a convenient benchmark for establishing relative net price among various comparators. Pharmacy benefit design and actual plan rebates have a greater impact on net price, as well as on formulary placement and patient out-of-pocket costs. Although cost-effectiveness is an important consideration, Pharmacy and Therapeutics committees, as well as prescribers, must consider additional factors, including adverse events. For example, among the IL-17A drugs (ie, secukinumab, ixekizumab, and brodalumab), brodalumab is the only one with a boxed warning for suicidal ideation and behavior. Cost-effectiveness models and their outputs are often considered in formulary decisions, but changes in drug cost can have a significant impact on the conclusions drawn, as is seen in the model discussed by Hendrix and colleagues, or in the validation done within an individual health plan. The drug cost is a foundation to the value equation; variance in this cost, or any estimates or assumptions based on this cost, will likely influence the comparative benefit of the drug outcomes versus alternative therapy options. By providing a real-world example of the impact of changing drug costs on the hierarchy of cost-effective therapy in plaque psoriasis, this case study serves as an example for similar considerations in other drug class value assessments. The authors would like to thank Kelley J. P. Lindberg for her assistance with editing the manuscript. Funding for the study used as the basis for this article was provided by Ortho Dermatologics. Publication of this article was not dependent on sponsor approval. Dr Brixner is Manager, Millcreek Outcomes Group, and a consultant to AbbVie, Sanofi, and UCB; Dr Oderda is a consultant to Heron Therapeutics; Dr Biskupiak has received a research grant from Ortho Dermatologics; and Dr Feldman has received research grants from and is a consultant to AbbVie, Celgene, Janssen, Lilly, Novartis, and is a consultant to Boehringer Ingelheim, Merck, and Ortho Dermatologics. Dr Burgoyne and Mr Avey have no conflicts of interest to report. Dr Brixner is Professor & Chair, Department of Pharmacotherapy, Executive Director, Outcomes Research Center, University of Utah College of Pharmacy, Salt Lake City; Dr Oderda is Emeritus Professor, Department of Pharmacotherapy, University of Utah College of Pharmacy; Dr Biskupiak is Research Professor, Department of Pharmacotherapy, University of Utah College of Pharmacy; Dr Burgoyne is Principal, Cooperative Benefits Group, Salt Lake City, UT; Mr Avey is Vice President, MedImpact Healthcare Systems, San Diego, CA; Dr Feldman is Professor of Dermatology, Wake Forest School of Medicine, Winston-Salem, NC. Stern RS, Nijsten T, Feldman SR, et al. Psoriasis is common, carries a substantial burden even when not extensive, and is associated with widespread treatment dissatisfaction. J Investig Dermatol Symp Proc. 2004;9:136-139. Nestle FO, Kaplan DH, Barker J. Psoriasis. N Engl J Med. 2009;361:496-509. Menter A, Gottlieb A, Feldman SR, et al. Guidelines of care for the management of psoriasis and psoriatic arthritis: section 1. Overview of psoriasis and guidelines of care for the treatment of psoriasis with biologics. J Am Acad Dermatol. 2008;58:826-850. Rapp SR, Feldman SR, Exum ML, et al. Psoriasis causes as much disability as other major medical diseases. J Am Acad Dermatol. 1999;41(pt 1):401-407. Karbach S, Croxford AL, Oelze M, et al. Interleukin 17 drives vascular inflammation, endothelial dysfunction, and arterial hypertension in psoriasis-like skin disease. Arterioscler Thromb Vasc Biol. 2014;34:2658-2668. Cohen BE, Martires KJ, Ho RS. Psoriasis and the risk of depression in the US population: National Health and Nutrition Examination Survey 2009-2012. JAMA Dermatol. 2016;152:73-79. Tong Y, Peranteau AJ, Nawas Z, Tyring SK. 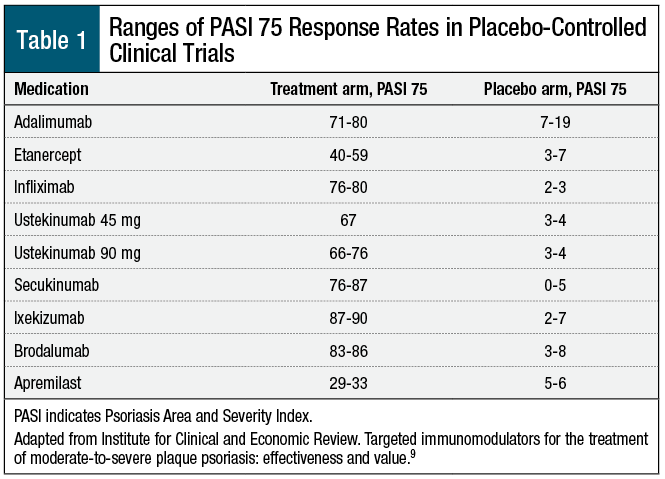 A review of brodalumab, an IL-17 receptor antagonist, for moderate-to-severe plaque psoriasis. Skin Therapy Lett. 2017;22:1-6. Agency for Healthcare Research and Quality. Biologic and nonbiologic systemic agents and phototherapy for treatment of chronic plaque psoriasis: research protocol. September 27, 2011. https://effectivehealthcare.ahrq.gov/topics/psoriasis-chronic/research-protocol. Accessed April 10, 2018. Institute for Clinical and Economic Review. Targeted immunomodulators for the treatment of moderate-to-severe plaque psoriasis: effectiveness and value. Final evidence report. December 2, 2016. https://icer-review.org/wp-content/uploads/2016/11/NE_CEPAC_Psoriasis_Evidence_Report_FINAL_012317.pdf. Accessed June 12, 2017. Nast A, Jacobs A, Rosumeck S, Werner RN. Efficacy and safety of systemic long-term treatments for moderate-to-severe psoriasis: a systematic review and meta-analysis. J Invest Dermatol. 2015;135:2641-2648. Dong J, Goldenberg G. New biologics in psoriasis: an update on IL-23 and IL-17 inhibitors. Cutis. 2017;99:123-127. Quatresooz P, Hermanns-Lê T, Piérard GE, et al. Ustekinumab in psoriasis immunopathology with emphasis on the Th17-IL23 axis: a primer. J Biomed Biotechnol. 2012;2012:147413. Papp K, Reich K, Leonardi CL, et al. Apremilast, an oral phosphodiesterase 4 (PDE4) inhibitor, in patients with moderate to severe plaque psoriasis: results of a phase III, randomized, controlled trial (Efficacy and Safety Trial Evaluating the Effects of Apremilast in Psoriasis [ESTEEM] 1). J Am Acad Dermatol. 2015; 73:37-49. Kalb RE, Fiorentino DF, Lebwohl MG, et al. Risk of serious infection with biologic and systemic treatment of psoriasis: results from the Psoriasis Longitudinal Assessment and Registry (PSOLAR). JAMA Dermatol. 2015;151:961-969. Siliq (brodalumab) injection [prescribing information]. Bridgewater, NJ: Valeant Pharmaceuticals; February 2017. 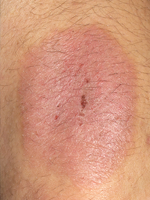 Galluzzo M, D’adamio S, Bianchi L, Talamonti M. Brodalumab for the treatment of psoriasis. Expert Rev Clin Immunol. 2016;12:1255-1271. Attia A, Abushouk AI, Ahmed H, et al. Safety and efficacy of brodalumab for moderate-to-severe plaque psoriasis: a systematic review and meta-analysis. Clin Drug Investig. 2017;37:439-451. Karaca-Mandic P, Joyce GF, Goldman DP, Laouri M. Cost sharing, family health care burden, and the use of specialty drugs for rheumatoid arthritis. Health Serv Res. 2010;45(pt 1):1227-1250. Schaefer CP, Cappelleri JC, Cheng R, et al. Health care resource use, productivity, and costs among patients with moderate to severe plaque psoriasis in the United States. J Am Acad Dermatol. 2015;73:585-593.e3. Armstrong AW, Zhao Y, Herrera V, et al. Drivers of healthcare costs among the costliest patients with psoriasis over three years in a United States health plan. J Drugs Dermatol. 2017;16:651-658. Pizzi LT. The Institute for Clinical and Economic Review and its growing influence on the US healthcare. Am Health Drug Benefits. 2016;9(1):9-10. Hendrix N, Ollendorf D, Chapman R, et al. 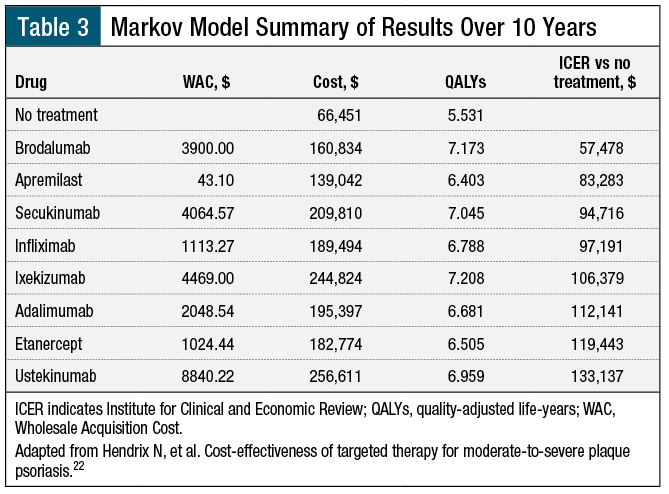 Cost-effectiveness of targeted therapy for moderate-to-severe plaque psoriasis: an analysis based on an Institute for Clinical and Economic Review (ICER) report. Poster presented at the ISPOR 22nd Annual International Meeting; Boston, MA; May 20-24, 2017. Villacorta R, Hay JW, Messali A. Cost effectiveness of moderate to severe psoriasis therapy with etanercept and ustekinumab in the United States. Pharmacoeconomics. 2013;31:823-839. Ferrándiz C, García A, Blasco AJ, Lázaro P. Cost-efficacy of adalimumab, etanercept, infliximab and ustekinumab for moderate-to-severe plaque psoriasis. J Eur Acad Dermatol Venereol. 2012;26:768-777. Mauskopf J, Samuel M, McBride D, et al. Treatment sequencing after failure of the first biologic in cost-effectiveness models of psoriasis: a systematic review of published models and clinical practice guidelines. Pharmacoeconomics. 2014;32:395-409. RED BOOK Online. Micromedex 2.0. Ann Arbor, MI: Truven Health Analytics; 2013. www.micromedexsolutions.com/micromedex2/4.34.0/WebHelp/RED_BOOK/Introduction_to_REDB_BOOK_Online.htm. Accessed November 15, 2017.